Surgery to fuse the lumbar spine. 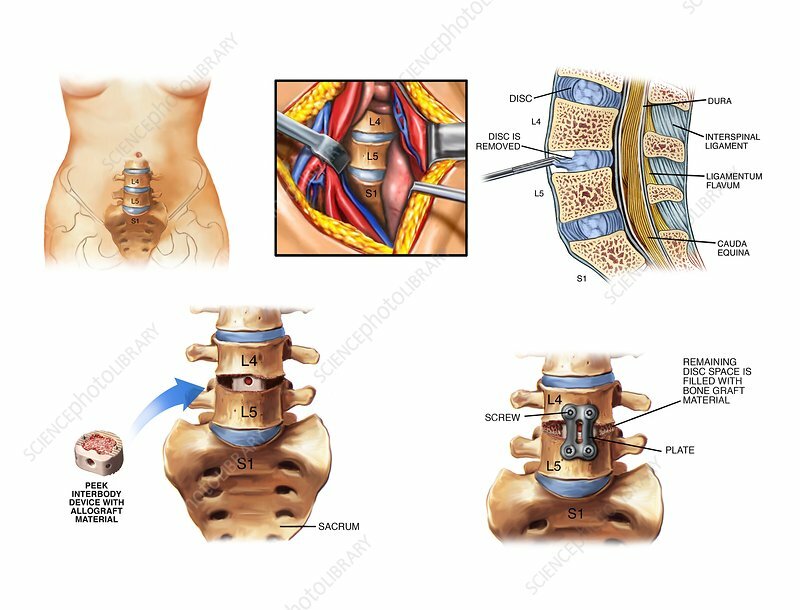 Sequence of artworks of an operation to replace an intervertebral disc with an implant. This procedure, taking place in the lumbar (lower back) region of the spine, is known as an anterior lumbar discectomy. At upper left is the L4-L5 joint seen from the front. At upper centre, surgical retractors are used to pull overlying iliac arteries and veins aside in an anterior approach. At upper right, the sagittal view shows disc removal. After smoothing of the vertebral endplates, a Peek interbody cage and bone grafts are inserted into the space (lower left). At lower right, the final stage is to fix screws and a plate to support the spine.